San Francisco: Station wagons are slowly coming back into style, perhaps because people don't want to give up the cargo space of their SUV but still want to save money at the gas pump. 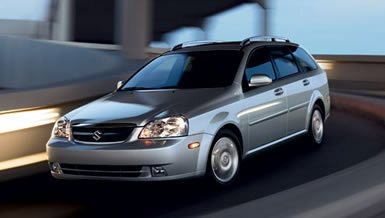 The Suzuki Forenza Wagon has SUV-like versatility with the price of a compact car. A tightly constructed interior in the Suzuki Forenza Wagon is much nicer than its $14,000 base price would suggest and this car has lots of features for the money. A couple of years ago it seemed car manufacturers would go to extraordinary lengths to keep from describing any of their products as a station wagon, probably because wagons were flushed down the fashion commode around the same time as parachute pants and scrunch-up socks. Instead, the car companies would come up with silly euphemisms - using the words "active," "sport," "crossover" and "utility" in various combinations - in a lame attempt to hide the fact their product was, of course, a plain old station wagon. Well, wagons are making a comeback, and for good reasons. They offer SUV-like cargo space without the top-heavy handling, and they get the same gas mileage as a family sedan with a slightly spunky attitude. What's not to like? Now Wagon is no longer a dirty word. One company jumping into the wagon mix is Suzuki, which offers a station wagon based on its mid-size Forenza sedan that starts under $14,000. For that price you get a competent family car that's practical and actually fairly good-looking, but it drives like its price would suggest. The cabin gets noisy on the highway, its ride is a little bouncy and sloppy, and its performance is merely adequate. Nothing really stands out about it when you get behind the wheel. Except, perhaps, what a bargain it is. Yes, it drives like a Toyota from 10 years ago, but it also looks and feels more refined than you'd expect from a car with its ultra-cheap price. The dash is actually very nice looking and has a solid, well-constructed feel that many cars lack. The seats are perfectly comfortable, and none of the switches and buttons feel like they'll fall off if you press too hard, a problem all too common in low-priced cars. Another impressive feat is the amount of standard equipment Suzuki includes on the base model, the Forenza Wagon S. It comes from the factory with air conditioning, a CD/cassette stereo player, steering wheel mounted audio controls, and power windows, locks and mirrors. It's a perfectly livable car, not some stripped-down beater with crank windows that requires you to pony up more cash before you'll be comfortable in it. Step up to the LX ($15,849) and you'll get remote keyless entry, cruise control, fog lamps, a power sunroof, 15-inch wheels and a leather-wrapped steering wheel and shift knob. The top-of-the-line EX adds an automatic transmission and leather seats for $17,449 (the automatic is an $800 option on other models). All models come with the same 2.0-liter, four-cylinder engine that makes 126 horsepower, which would feel sluggish with an automatic transmission. With a five-speed manual in the Forenza I tested, acceleration didn't pose much of a problem, although I did find myself pushing the engine all the way to redline more often than on most cars. It also sounded fairly rough and unpleasant at those high RPMs, so nobody will confuse it with the silky sound of, say, a Honda. On a bright note, I couldn't find anything to complain about from a practicality standpoint. The cabin was roomy enough for a small family, and cargo room was cavernous whether the seats were up or down. It can carry 24 cubic feet of cargo with the seats up or 61 cubic feet with the seats down, which is enough space for virtually any shopping trip. It also showed how wagons became so popular in the first place, offering the comfortable ride of a car with the cargo space that comes close to that in vans and SUVs. They're definitely coming back into style. Let's just hope purveyors of parachute pants don't get the same idea.